tl;dr: Find the pattern recipe here! Another Stitches West has come and gone! As always, this one was a big success! The stash was enhanced, inspiration abounded and I got the Seal of Approval for my newly finished rainbow welted skirt from Mr. Welt himself! WestKnits selfie! Dude has long arms! It’s always a pleasure to chat with Stephen, especially when he’s admiring my work! I was pretty excited! Actually, everyone admired my work…that was even more exciting! I go all fangirl over Stephen West, in every situation, that was a given. The compliments from the Market Place masses are more encouraging though! 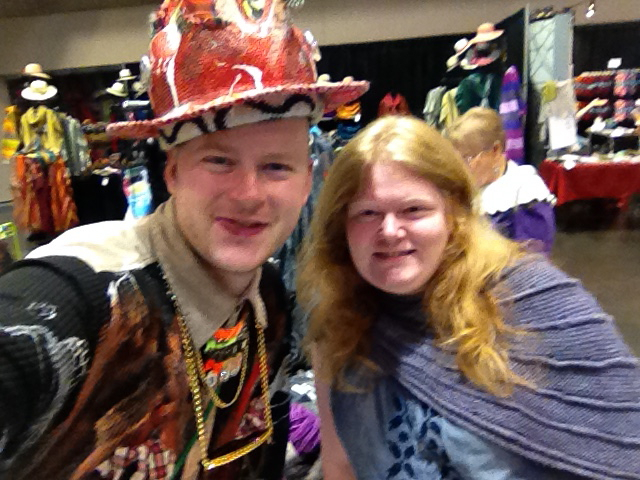 I love talking to knitters! I emptied my wallet of cards, I was so excited about the skirt itself, I didn’t actually occur to me to bring more! So, welcome to the Knitters of Stitches! I’m glad you’ve found your way here! As promised there will be a pattern recipe in just a moment! First some details! I’m completely in love with this skirt! The lopi provides a firm fabric to begin with, add in the welts and it’s got great structure, quite like a hoop skirt! It just begs to be twirled and wiggled and shaken. It’s just so fun! And it’s hit the Goldilocks sweet spot, not too hot or too cold! It’s just right! and it’s hasn’t been too itchy. It’s one thing to say you’re okay with rustic wool, but I’ve really put it to the test this time, so far, it’s all good! Pattern Outline, plug in your own measurements and I walk you through the calculations you have to make to customize your own skirt fully! I would love to see pictures if you give it a try! Eventually I’ll get this fully formatted and onto Ravelry. In the meantime, enjoy it here! 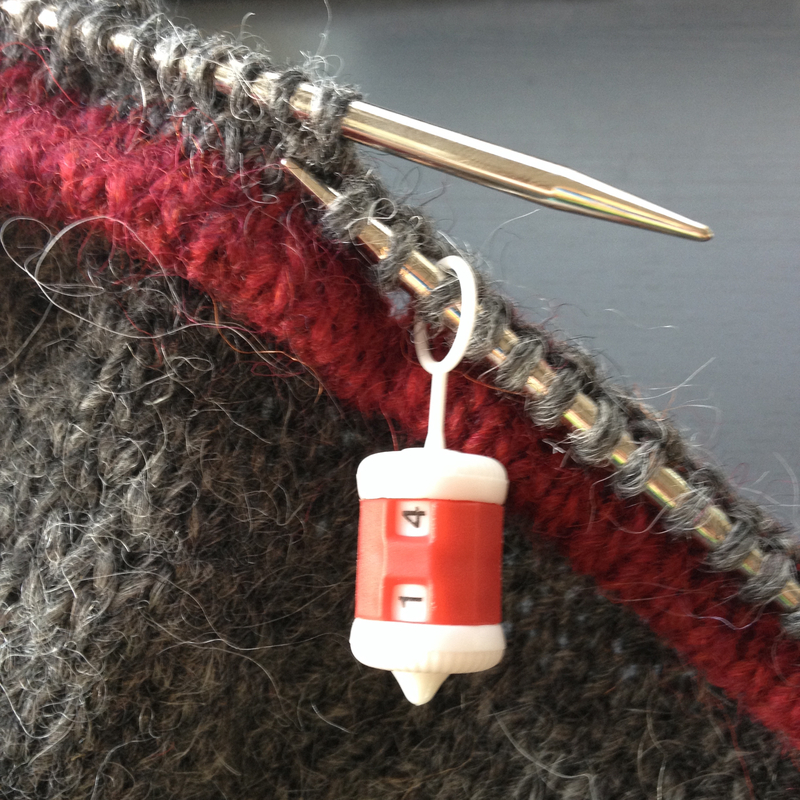 As always, I have no problem generating knitting content…I’ve got lots planned for this week! Stitches Stash Enhancement and a full Stash Flash, a Planned Pooling WIP, a 24 hour Cast-On-Palooza and another FO already! Assuming of course, I don’t get lost in the stash pile! Knitting needles in motion tend to stay in motion. Okay, maybe that’s not what Newton meant…but it’s true for me this week! Nothing is more motivating than seeing a project I’ve designed, come to fruition, even better than expected! I’ve finished the green welt and the blue stripe is a welt-in-progress! This leaves me 10 rows of stockinette, a row of welting and a 3-needle bind off! Sew a tad of elastic, weave ends and I’m done! 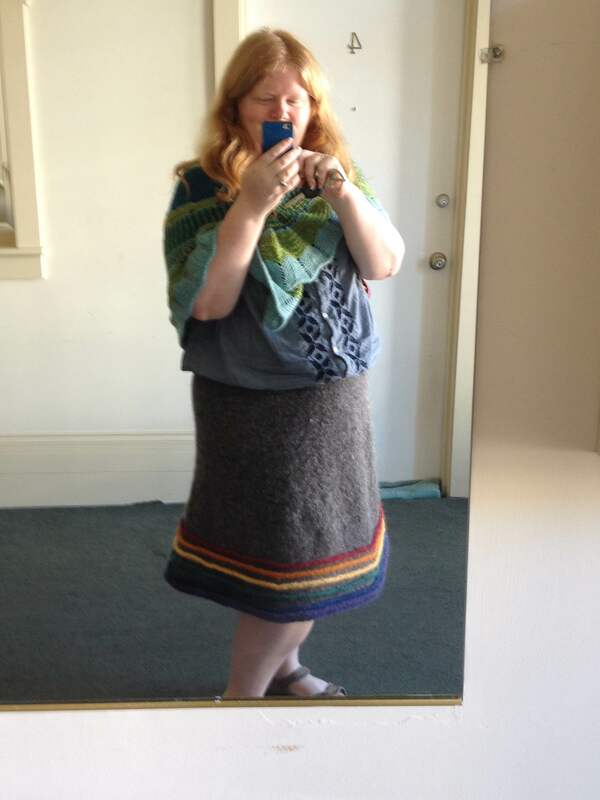 The yarn fumes must be getting to me…I’m having visions of wearing my skirt tomorrow! I’m nearing the fine line between motivated and delusional. Tomorrow may be a double FO Friday!! Yesterday, I was hoping to make it through the yellow welt, fingers crossed! A healthy dose of late night knitting brought me all the way through the green stipe and it is being welted as we speak! This is exciting! This year my goal was a Stitches Skirt and I think it’s actually going to happen! My Stitches attendance has been uncertain until now but I think this could all work out, as if I’d planned it! Twenty-two rows and a 3 needle bind off are the only things standing between me and my skirt strutting the fashion show that is the Stitches Marketplace on Sunday. Really, this is Exciting!! <- with a capital E! 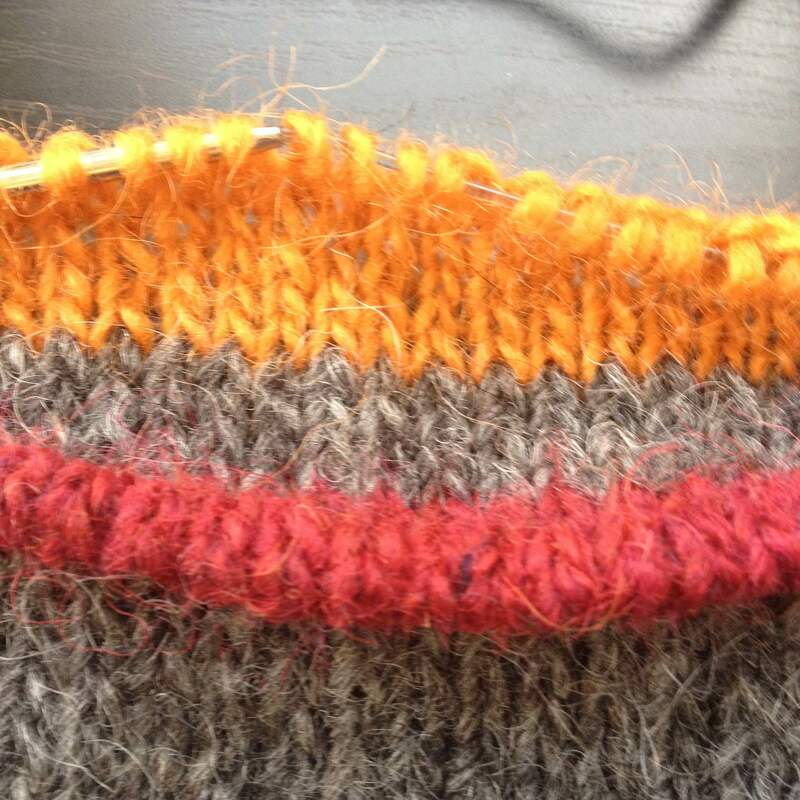 The orange stripe is knit and ready for welting! Along with the rainbow, the welts are the key design feature. What is a welt? I’m glad you asked! In knitting, it can refer to two different techniques that both put 3d texture into your fabric. The first method is simply knitting several rounds and then purling several rounds, resulting in a sort of horizontal ribbing. The Welted Cowl by Jane Richmond is an example of this technique. 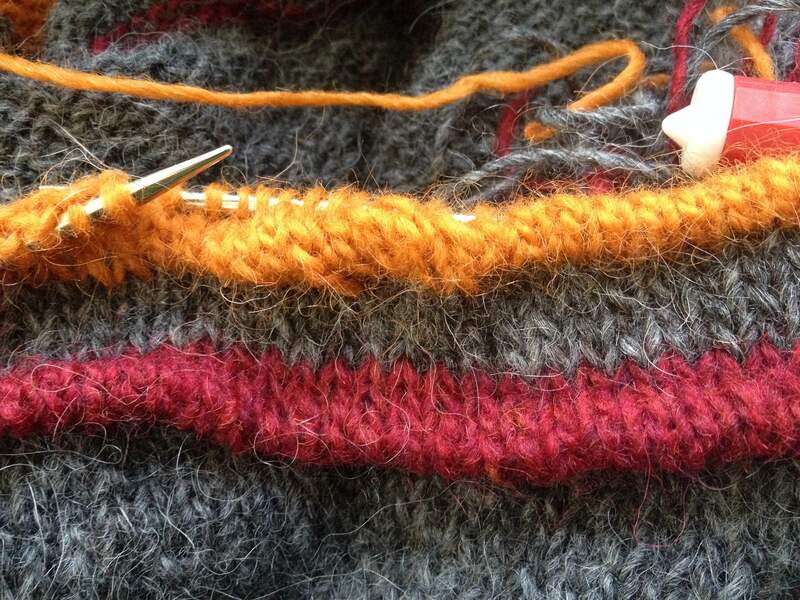 It creates a soft, flexible, stretchy fabric, exactly what you’d expect from ribbing. The second welting technique, the one I’m using, physically pinches the fabric together and secures it. How is this pinched welt made? The first step is to create the fabric that will be pinched. In this case, I am knitting six rounds of each color and joining the first round of color to the round of live stitches on the needle. 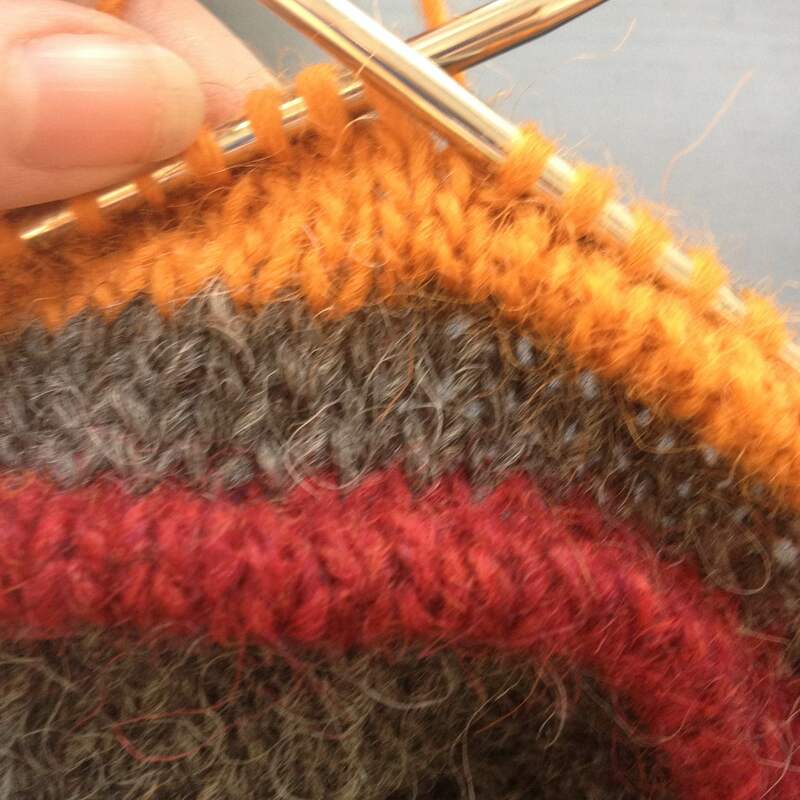 With the left needle, I am reaching behind my live stitches and picking up the orange bump at the bottom of the column, six rounds down. 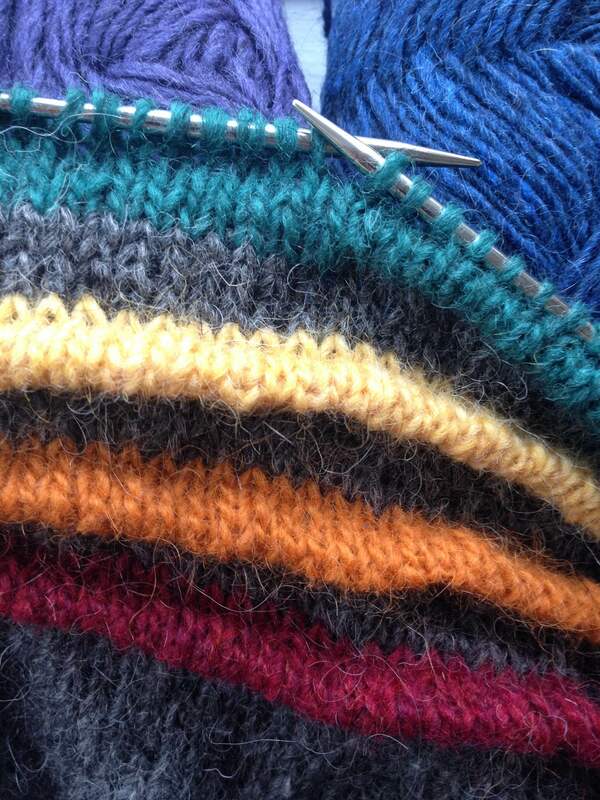 I then knit this bump together with the first live stitch on the needle. Your first column of stitches is now folded and secured! 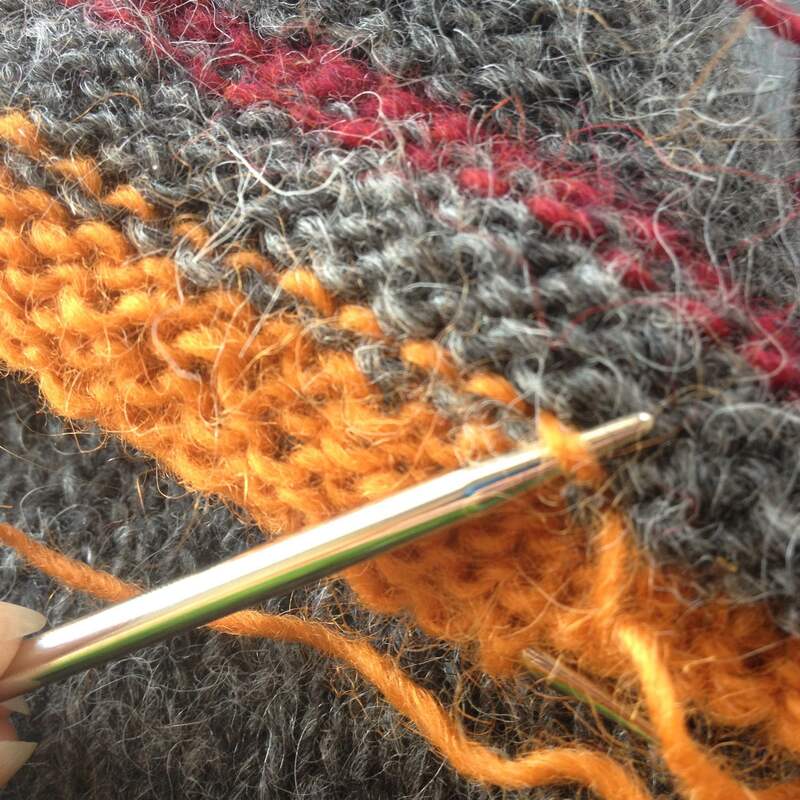 Repeat the process for each stitch in the row, being careful to match up the live stitch with the proper bump below! You can see the red welt is laying smooth and even, while the orange welt is looking a bit cattywampus. I would politely suggest that’s a “design feature” you want to avoid. 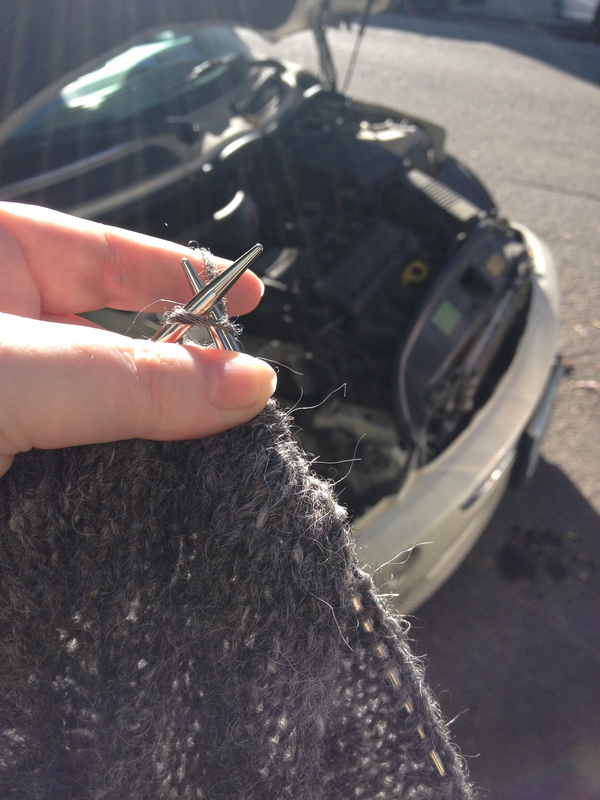 One note about the ‘bump’ I’m picking up….technically speaking, it’s not the purl bump but rather the running thread between two stitches (aka the horizontal bar you’d pick up to M1). I do this because it’s the easiest to see, the color change highlights it well. Being easy to see means I’m always getting the next bump in the row, so while I do have a small half stitch jog, I’m still getting nice straight columns which is what I want. 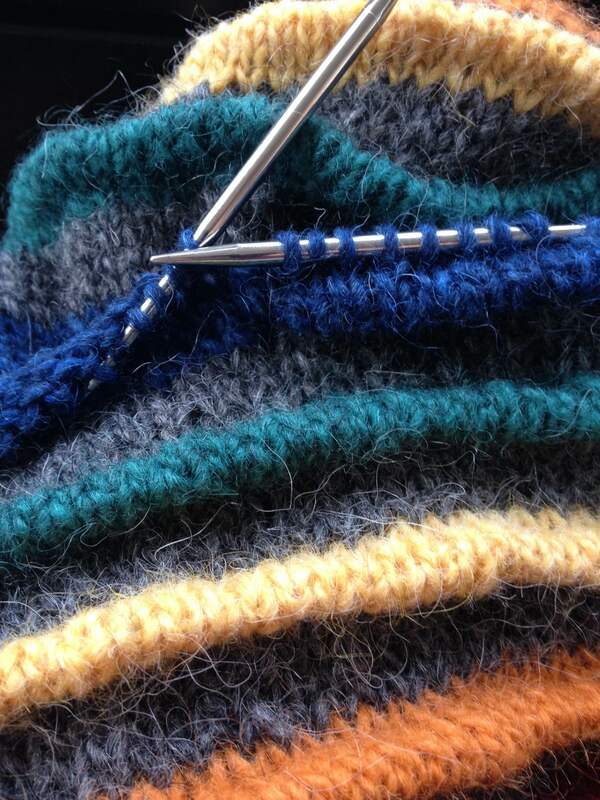 The half stitch jog just means that when I get to my last stitch, I have no bump to pick up. This happens because there is no running thread when I first join a new yarn. I’m okay with one stitch not being secured. I like to live on the edge. I’m just mentioning it for the perfectionists. You could actually match the purl bump to the live stitch, have a 1:1 stitch count and completely, totally straight columns. It would take me 3x longer so I take the shortcut. 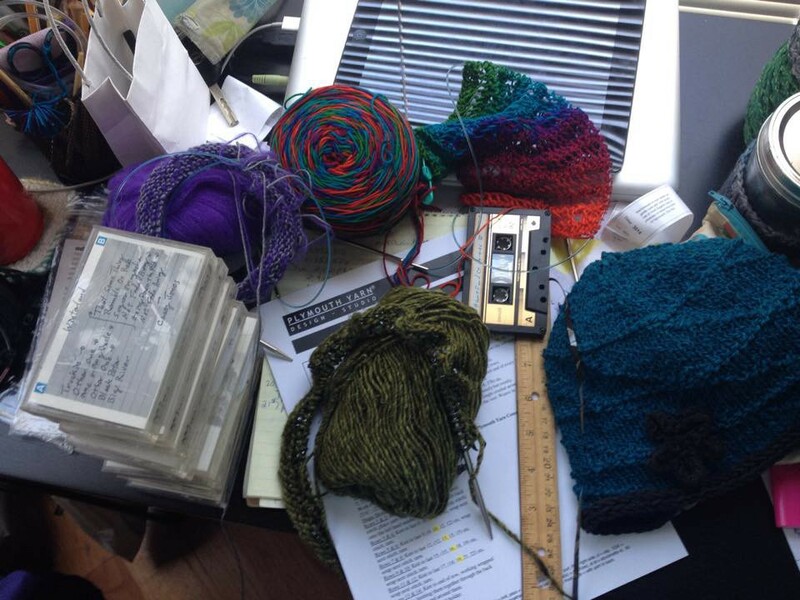 I’ve been daring The Knitting Police to come get me…maybe this will finally be the time! The time has come for the big reveal…the project I want to wear most! 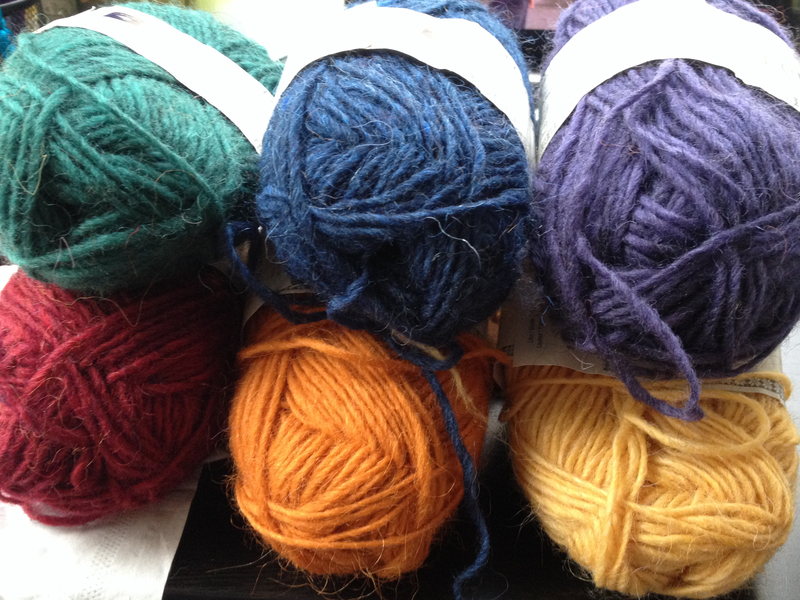 It’s been my favorite for years…well before I bought the yarn! 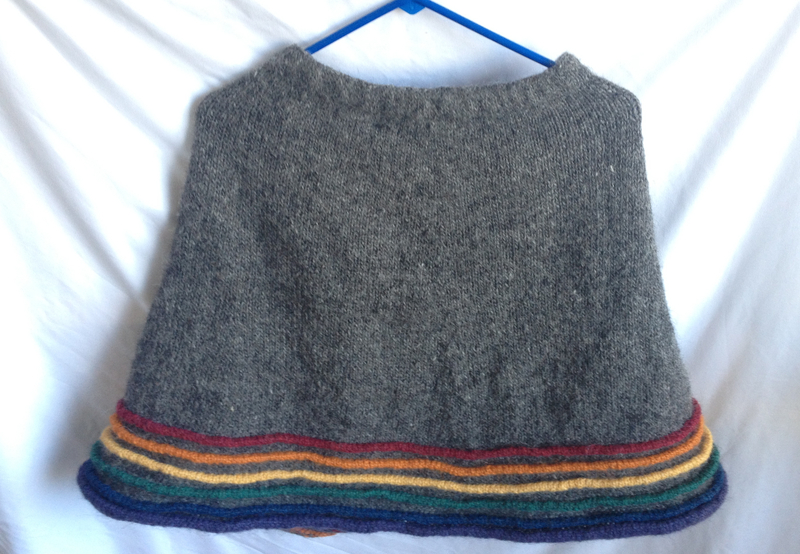 I’ve been dreaming about knitting a skirt for a long time and that dream is nearly a reality! 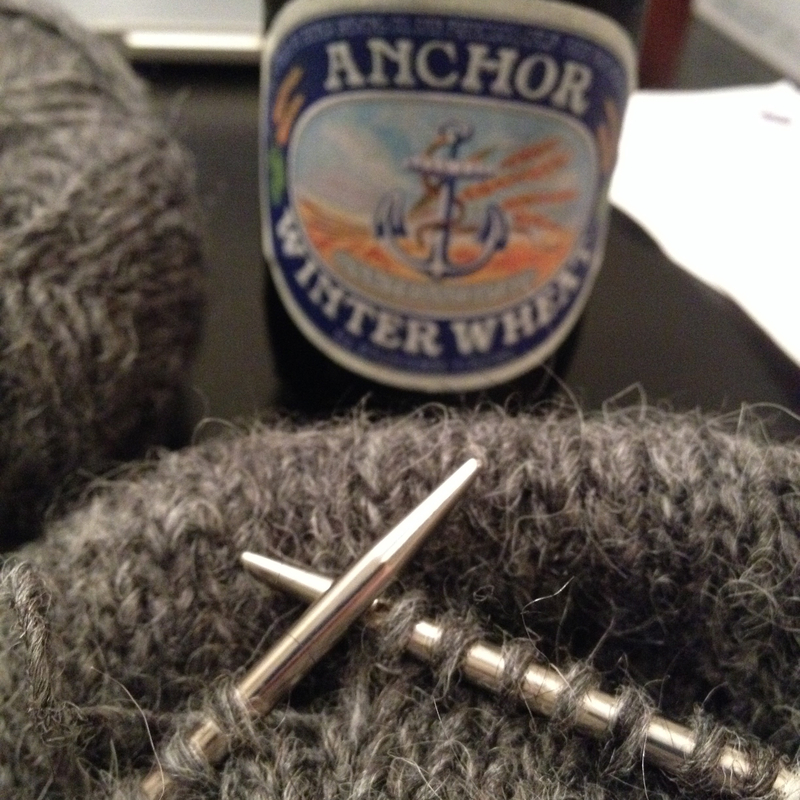 The first couple weeks were for the process knitter in me…miles of grey stockinette! Finally though, just went I thought it would never end, I got to the fun part…the color! and not just any color but rainbow! Pattern: My Own Design, just your basic, everyday, A-line skirt with rainbow welts! Yarn: Lett Lopi, 100% wool, ‘rustic’ is a nice way to put it!